Ignorance based cardiology : How common is “myocardial congestion” in cardiac failure ? Is there myocardial congestion in cardiac failure ? Genesis of edema in any tissue depends on local hydrostatic pressures, tissue resistive forces, osmotic balance, and cell membrane permeability. In the myocardium individual contribution of above factors are not known. Apart from total myocardial water content , myocardial water logging depends upon the trans myocardial venous gradient and the coronary sinus exit pressure in right atrium.Technically ,any severe right heart failure should lead to myocardial congestion at least to some degree.Unlike the lungs , the myocardial edema fluid doesn’t produce crackle , (May cause S -3 gallop instead) . However ,we have modern technology to image water inside the myocardium. Yes, it is called proton / hydrogen imaging or simply called MRI . This is especially evident In chronic kidney disease , where in the fractional water content within the myocardium is expected to increase further as the whole body is water logged. We have seen time and again patients with CKD improve in LV function immediately after dialysis . It happens like a magic . The mechanism is simple .The over-hydrated cardiac Interstitium threatening to drown the myocytes is promptly dehydrated by dialysis. This was my wild guess until I came across this paper which proved the exact points. 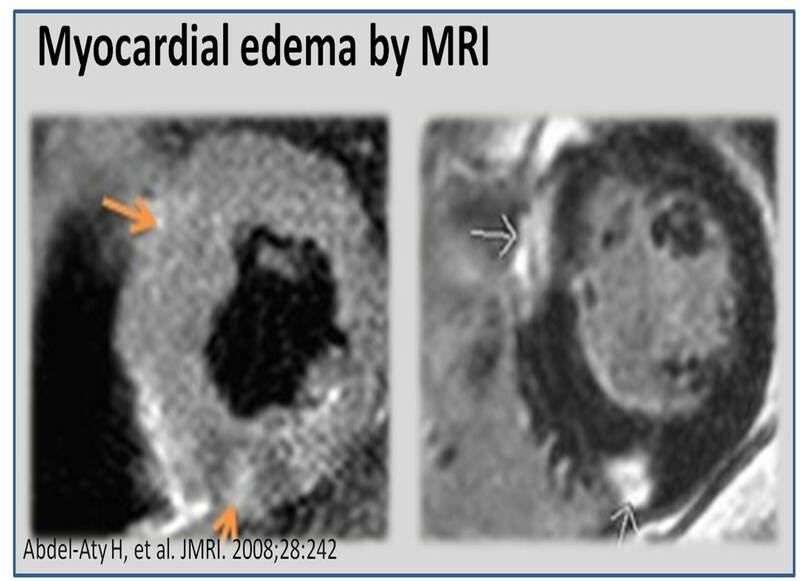 Myocardial interstitial edema in cardiac failure is a grossly under diagnosed entity. A water-logged myocardium is classical at least in CKD. We know it can severely compromise the LV function especially, the diastolic function that explains the all too common flash pulmonary edema in CKD. The number of studies in this topic (Myocardial Hydrology !) is minuscule compared to other areas of research in cardiology literature.There is a need to involve both Nephrologist and cardiologists to explore this curious concept of dialysable left ventricular mass in CKD/Cardio renal syndromes ! It is reasonable to believe, cardiomegaly in cardiac failure is primarily related to the increased end diastolic volumes .Still , we are not clear whether there is net increase in cardiac mass as the surface area of the heart increases with dilatation. (Even in DCM ? ) Whenever myocardial mass increases relative increase water is likely. Does the beneficial effect of diuretics in cardiac failure , and the restoration of LV dimension is due to myocardial interstitial diuresis as well ?